The new Audi A7 Sportback will be available to order in the UK from early 2018, with prices starting at £56,000. 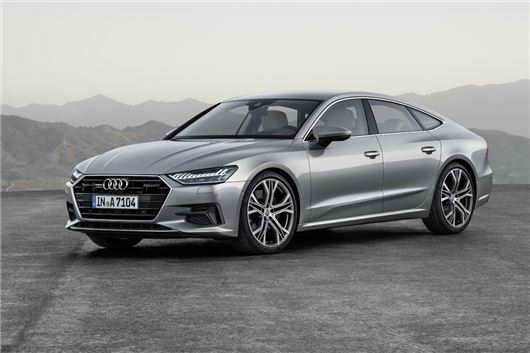 The new five-door Audi A7 Sportback will initially launch with a 3.0 TFSI petrol engine developing 340PS and 500Nm of torque. Now badged as the Audi A7 55 TFSI, it returns a claimed 41.5mpg with CO2 emissions of 154g/km. Following shortly after that will be the familiar 3.0 TDI and expect to see an e-tron version too. That said, all A7 Sportback models will come with a mild hybrid system. Using power from the brake to charge a lithium ion battery, this allows the car to coast with the engine off between 35mph and 99mph. Acutely aware of its luxury target market, the A7 boasts an improved boot space of 535 litres, "so that two golf bags now fit horizontally". This increases to 1390 litres with the rear seats folded down and the electric tailgate is foot-operated, so that you don't get your hands dirty. Like the new A8, up to seven drivers can store their preferred settings in individual user profiles, with as many as 400 options. The online services from Audi connect have also been expanded to include features such as the traffic sign and hazard information. In addition, the A7 Sportback has a total of 39 driver assistance systems, designed to make daily use easier for the driver. These are split into three packages: Audi AI parking, City assist and the Tour assist package. The latter includes things like efficiency assistant, which reduces fuel consumption and the adaptive driving assistant, which supplements adaptive cruise control with steering interventions designed to keep the car in its lane. The car comes in a choice of 15 colours, eight of which are new. S line models will also have the radiator grille and the front air inlets, the sills and the front and rear diffusers trimmed in gloss black.